BAIC Foton Motor Co., Ltd. Founded on August 28, 1996, Foton manufactures light and heavy-duty trucks, agricultural tractors, and various other machinery. In addition to the heavier trucks, Foton also builds a copy of the Toyota Hiace H100, called the "Foton View" or "Foton Alpha". In March 2006 Foton and Cummins Inc. announced the creation of a 50:50 joint venture company, Beijing Foton Cummins Engine Company (BFCEC), to produce light-duty diesel engines, of 2.8 and 3.8 liter displacement. In January 2009 Foton and Daimler AG agreed to form a 50-50 joint venture for the production of medium- and heavy-duty trucks in China, with an initial investment of 6.35 billion yuan. Creation of the venture received the approval of the Chinese government in July 2010. In October 2009 Foton agreed to form a joint venture to develop and produce vehicle batteries with Pulead Technology Industry Co. In July 2010 Foton announced the establishment of a European headquarters in Moscow, Russia. Foton established a sales company in India in April 2011. Foton will build an assembly plant in Colombia, in order to participate in the growing Latin American market for light commercial vehicles. The company also plans to build a plant in Western Maharashtra, India. Foton has announced a bus factory in Brazil in the state of Bahia, as part of their globalization plan. Foton has held a press conference in 2015, previewing the Sauvana while announcing news to bring the brand to the United States. In September 2017 Foton and Piaggio agreed to form a joint venture to develop and produce light commercial vehicle. Based on Foton chassis the new vehicle was sold by Piaggio Commercial Vehicle division in Europe and in all market around the world but not in China. The vehicle was intended as a successor of the Piaggio Porter and production was planned to starts in the mid 2019 in Pontedera (Italy) with all components produced by Foton in China. 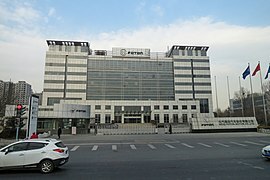 Foton is headquartered in Changping District, Beijing. Foton's business units are seen in cities and provinces such as Beijing, Tianjin, Shandong, Hebei, Hunan, Hubei, Liaoning, and Guangdong. Its R&D branches are distributed in Japan, Germany, Taiwan and The Philippines. It has assets exceeding 50 billion Yuan and 300,000 employees. Foton, whose brand value exceeds 61.932 billion Yuan in 2005, ranked No.1 in auto industry and No. 11 in the “Top 500 Most Valuable Brands”. Foton business marquee also consists of a branch in Ulaanbaatar, Mongolia. Och motors LLC which is one of the biggest conglomerate in Mongolia, is the official distributor of Foton in Mongolian market. Foton Motor sold a total of 640,400 vehicles in 2011. ^ "Cummins to create joint venture with Foton". China Daily. 30 October 2006. Retrieved 11 November 2013. ^ "Cummins to Form Joint Venture in China". Inside Indiana Business. 7 March 2006. Retrieved 11 November 2013. ^ "Daimler enters China truck market". The New York Times. 7 January 2009. Retrieved 11 November 2013. ^ "China's Foton, Daimler to form $929 mln truck JV". Reuters. 6 January 2009. Retrieved 11 November 2013. ^ "Daimler gets approval for truck JV with China's Foton". The Economic Times. 16 July 2010. Retrieved 11 November 2013. ^ "Foton and Daimler in Truck Joint Venture". ChinaAutoWeb.com. ^ "Foton JV taps new energy". China Daily. 27 October 2009. Retrieved 11 November 2013. ^ "Beiqi Foton opens Europe HQ, Russia unit in Moscow". Gasgoo. 1 July 2010. Retrieved 11 November 2013. ^ "Foton to open Indian sales branch". Gasgoo. 24 April 2011. Retrieved 11 November 2013. ^ India, Press Trust Of (2 May 2011). "China's Foton selects West Maharashtra for Rs 1,676 cr plant". Retrieved 12 April 2018 – via Business Standard. ^ Line, A TARDE On. "Página principal do Portal A TARDE". uol.com.br. Retrieved 12 April 2018. ^ "Foton Caminhões". www.fotonmotors.com.br. Retrieved 12 April 2018. ^ "2014 Guangzhou Auto Show: Foton Sauvana SUV debuts in China". ^ "Beiqi Foton's 2011 profits slump 30%". China Daily. 2 March 2012. Retrieved 11 November 2013. Wikimedia Commons has media related to Foton vehicles.